Millions of people all over the world share the same dream of breaking into the fashion industry. Unfortunately, most of these millions simply cannot commit to full-time education or training. In turn, a whole world of talent, passion and enthusiasm goes to waste. Contrary to popular belief however, it is perfectly possible to begin building a successful fashion career at home. It’s simply a case of using your own time to build the skills, knowledge and confidence to go pro. First up, it’s important to ensure you understand the mechanics and specifics of the fashion industry in as much detail as possible. The deeper your understanding of the industry, the better your chances of becoming a part of it. 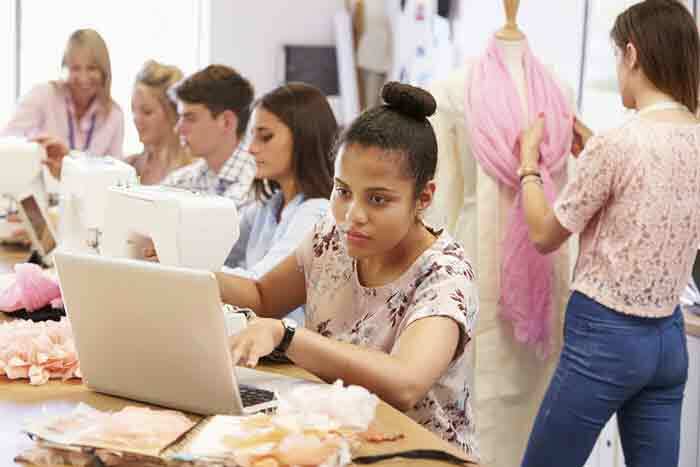 If you’re unable to commit to more formal educations programs, an accredited online fashion design course could be a good place to start. Creativity and vision are of no real value without the practical skills to bring them to life. Whatever your current capabilities with a needle, sketchbook or dressmaker’s dummy, there’s always room for improvement. Use your time to continually hone, refine and develop your practical design skills to a more professional level. In terms of how to learn fashion designing at home with a future career in mind, the key lies in focusing your efforts accordingly. You need to pinpoint the area of fashion design that appeals to you most and suits your vision/aesthetic. It’s impossible to get ahead if you spread yourself and your talents too thinly. Decide on the area of fashion you’d like to focus on primarily and do precisely that. Likewise, you’re going to need to establish a unique selling point (USP) for your fashion brand. What is it that makes you stand out from other fashion designers? What is it about your designs that makes them unique? How are you going to differentiate yourself from rival designers? Isolate your USP and make every effort to emphasise it. You might not be a professional fashion designer yet, but you still need to act like one. Which means establishing and building your own personal fashion brand. Launch a website, get yourself active on social media and make your voice heard. And of course, the value of a solid online portfolio of your work speaks for itself. The stronger your online presence, the more likely you are to be taken seriously as a professional fashion designer. Getting that all-important big break usually comes down to who you know, rather than what you know. If you get to know the right people in the right places, hitting the big time becomes a much more realistic possibility. Which is why you need to make every effort to network like crazy on a constant basis. Attend events, reach out to influential individuals and nurture strong professional relationships. When starting out in fashion design, the only thing that matters is getting your work seen, worn and recognised. Fame and fortune, by contrast, come further down the line. As such, you need to be willing to start out as small and humble as necessary to get yourself on the right track. Volunteer with established fashion businesses, give clothes away if it’s likely to result in positive exposure, work hard and accept that you might got nothing in return. In short – be realistic with your expectations. Last but not least, it’s largely unheard of for anyone to crack the fashion industry and become a global success story overnight. Chances are, it just isn’t going to happen. Becoming a successful fashion designer takes time, patience and the ability to overcome various challenges along the way. It isn’t going to be an easy ride, but the rewards at the end of the journey make the effort more than worthwhile. For more information on any of our online courses, get in touch with the Brentwood Open Learning College admissions team today.